The cost of World War II is unimaginable, from the number of lives lost to the monetary expenditure to fight and later bring some living and dead back home. Many people today are under the assumption, based on misinformation that has circulated, that the U.S. government paid for every penny of the expense to return a soldier’s remains to the U.S. and bury him anywhere the family desired. Unfortunately, that was not the case. Please meet Pvt. Joseph S. Kilian. I did locate a photo of Joseph on a family tree on Ancestry, but do not have permission to use the photo at the time I am writing this article. Joseph was part of Battery C 185th Field Artillery 34th Infantry Division. ASN: 33130298. He was Killed In Action 20 February 1943 in North Africa. He still rests there today. Joseph is one example of a soldier who was unable to return home once the war was over. 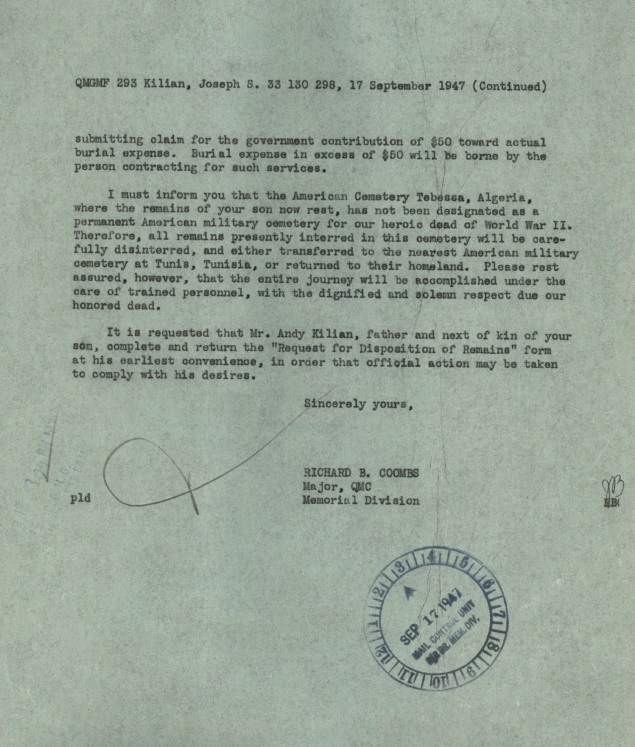 As you read through his Individual Deceased Personnel File (IDPF), not only do you learn about his service and death, you see his father wrote letters asking about the return of remains. One stated he was too poor to afford to bury his son in the U.S., even if the military returned Joseph’s remains. 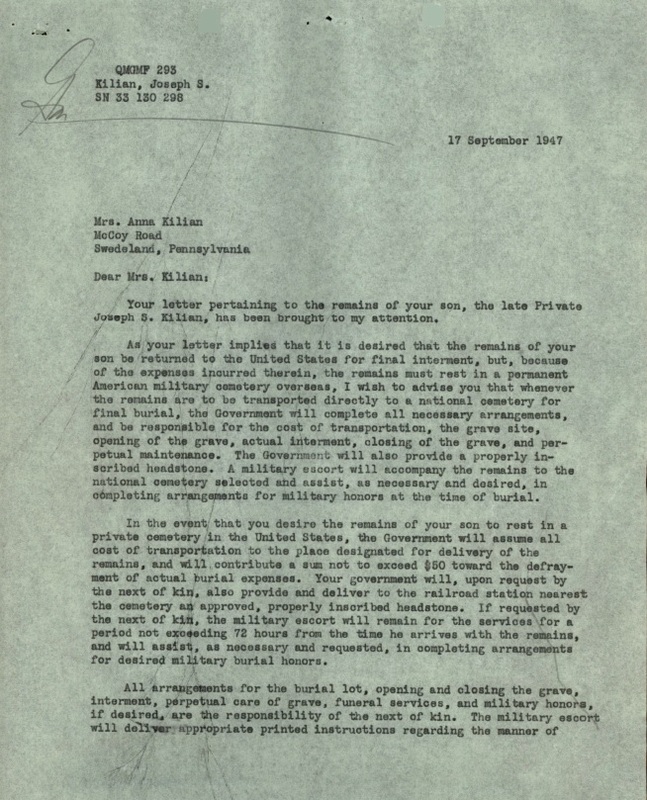 The military responded about the costs of repatriation in a two page letter. Sadly, Joseph’s case is not the only one in which a family could not afford to bury their son or daughter. Joseph’s father says, “I gave my son up to die for our country. But the government hasn’t repayed me a red cent.” (3 page letter p.35/79 IDPF). I do not have all the answers as to why the government chose to only pay for certain things (burial in a national cemetery) rather than other things (burial in a private cemetery). I can only share the information as it was presented to families. As we research the service members in our families, we should not only be looking at names, dates, and places. We should explore the dark depths and secrets of the family situation. From these things, we can learn so much more about those who have gone before us and ourselves. View Joseph’s Individual Deceased Personnel File (IDPF). 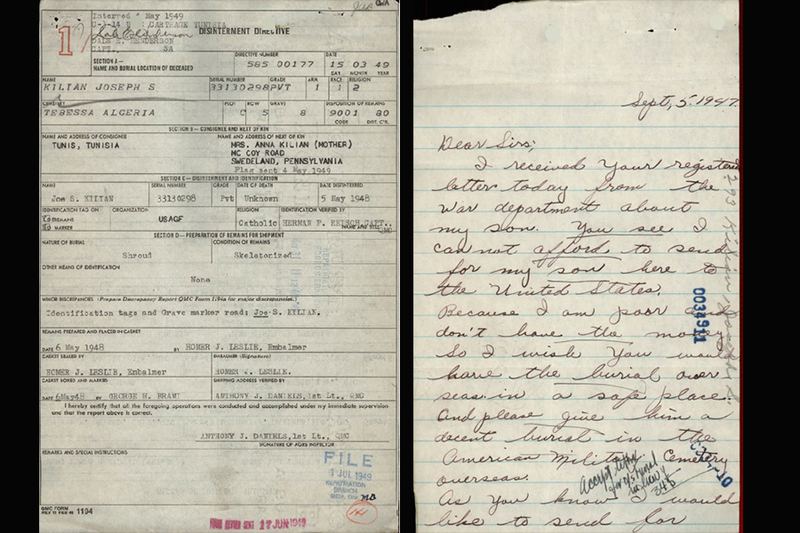 Do you need help researching your WWI, WWII, or Korean service member? Contact us today and ask how we can help! I am very interested in the cost of Repatriating Military remains, especially from North Korea. I would like to have a dollar amount that we (American government) will be paying to the North Korean government. From my research, I think I understand that some costs are the US government and other costs are the families. Thank you for your expected response to my request. Hi Judy. Thank you for visiting my website. My article was on the cost of war in WWII, primarily meaning the cost to the families in both monetary stress and emotional pain, to give people a new perspective and understanding of what took place then and why some of our boys did not come home when they might have.